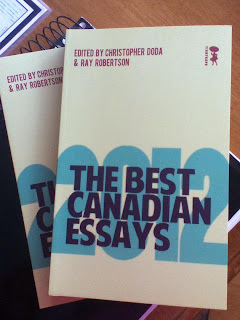 Last August I received word that my essay, "All I Can Say," would be part of Best Canadian Essays 2012, published by Tightrope Books. Last week, I received my contributor copies. Yes, my essay really is in it. Really truly. NOW it feels real -- like really REALLY real! You can order a copy from the publisher -- or check your neighbo(u)rhood indie bookstore. You never know who might be carrying it! Thanks again to Room for initially publishing the essay and to the hardworking folks at Tightrope Books for including it.